Your step-daughter is an heiress of a large fortune. Supposing her death leaves you all her fortune. Why not kill her? No problem. 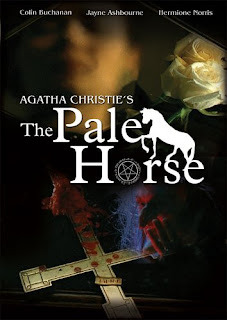 Go to The Pale Horse. The Pale Horse is a mysterious organization that is aimed at the removal of unwanted, but rich people. Does Thryza Gray's black magic actually bring the deaths people? A forgotten and hidden death wish is aroused in the heart of the victim and he dies a natural death. Does the black magic really work? This is what narrator, Mark Easterbrook, is going to uncover. When Mark finds that neither Hermia nor Dr. Corrigan would help him dig this up, he meets a red-headed girl called Ginger. This mystery, however, would put Ginger's life in danger. Would Mark be able to save her as well as solve the mystery? The book title didn't appeal me; I decided to read it though. I wasn't the least bit in interested in the idea of black magic, some of you may like it though. But the story went well, ended well, sometimes slow, a bit boring, but a good one.